If you have not noticed yet, I am definitely trying to make the most of the extended holiday weekend. It is amazing how much more you can get accomplished with 24 additional hours to consume – not to mention the weather down in the teens with a good wind punching up the chill factor tends to keep me inside in the warm den. Most of you should know by now, ever since starting the sister site Wildlife Intrigued, I try to keep my social interactions/observations/commentaries out of the wildlife related posts preferring to keep those dedicated posted only on the Life Intrigued flagship site. However, there are times when those experiences are too intriguing (in this case read hilarious) that I can’t wait. As a quick one, my wife recently placed an order at a local pizza joint. This particular establishment has odd sizes for their orders always prompting a discussion on what size we should order just for the two of us. I heard her ask the order taker on the phone for assistance on the average number of people a particular size offering could feed. She then went silent with a quizzical look on her face followed by a muffled chuckle. She later told me the reason for the reaction – the clerk indicated he wasn’t sure, “but it does come in eight pieces”. I’ll let that sink in a bit if the humor hasn’t already materialized. Meanwhile, how about we get to the real feature of post. No surprise here, ANOTHER birding find from our trip to Texas back in January 2017. Like the last post on the Altamira Oriole, this new addition to my birding list comes to us courtesy of Laguna Atascosa Wildlife Refuge. Thanks to an overheard response by the ranger at the visitor center, we now refer to this birding hotspot as the Sticky Mud Lagoon. A visitor wanted to know what Atascosa stood for…a question we had never thought to ask. Now we all know thanks to a knowledgeable employee. This southwestern Buteo became quite the stumper when trying to ID it. The rufous coloring on the shoulders initially led me down the Red-Shouldered Hawk path. The rather clear white breast left a lot of skepticism once I had confirmed the Red-Shouldered has a fairly barred chest and lot more streaking on top of the wings. 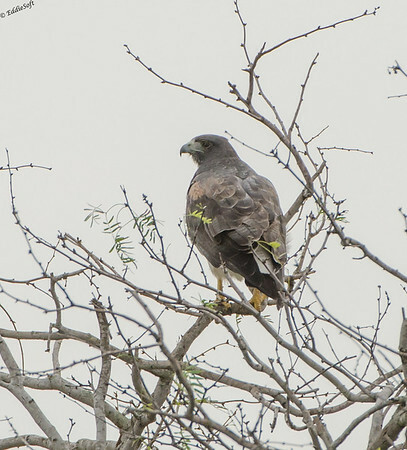 A quick search of southern hawks produced the possibility of the Harris’s Hawk. The region was localized to the south Texas region, so that was a positive. 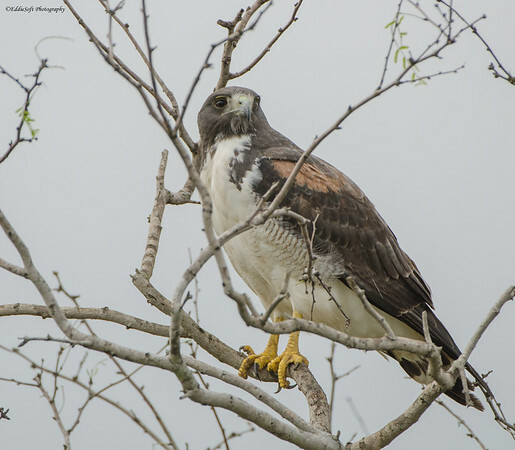 Definitely has the red shouldering, but based on reference shots of that particular Buteo, it appeared the marking on the Harris’s is significantly larger than the patch on our specimen. A quick validation of the chest coloring knocked that ID out of contention. The Harris’s sports a dark breast and carries the reddish coloring down through the leg feathering. I am pretty familiar with the Hawks in the Midwest and those encountered out west. The large size (larger than the common Red-Tailed) of this one and more solid markings were not aligning. Opting to look at each and every Hawk in my reference books, eventually came to the conclusion that this particular specimen was likely a White-Tailed Hawk. This was initially dismissed because the reference book shots has the long wings moved off of the tail giving me the impression the tail was always visible and distinctively white. In reality they have very long pointed wings that do hide their white tail feature. There is also a black tail band near the tip. If you look closely at the two pictures above you will just barely see it between the twigs of the tree. Fairly certain on my end, I sent it off for confirmation from my brother Ron. His first response was “Red-Shouldered” which prompted a recounting of the process that got me to the White-Tailed. Upon further analysis and some dead on reference shots on the web we are now in complete agreement – a new +1 and yes, another bird Ron will have to make an effort to catch up on. For reference, here is the backside of the Hawk showing the fairly solid coloring and those long tapered wings. Linda and I encountered this bird on the way out of the refuge. The day was coming to a close, but following my golden rule, of “If you see it, shoot it”, made Linda pull to the side so I could get a few shots in the tin – thus the limited perspectives. I already covered some of the unique aspects of this new bird. To add a couple more facts, the white tail and black band is unique for Buteos in North America – had I been able to get an inflight shot, the ID could have been a lot easier. 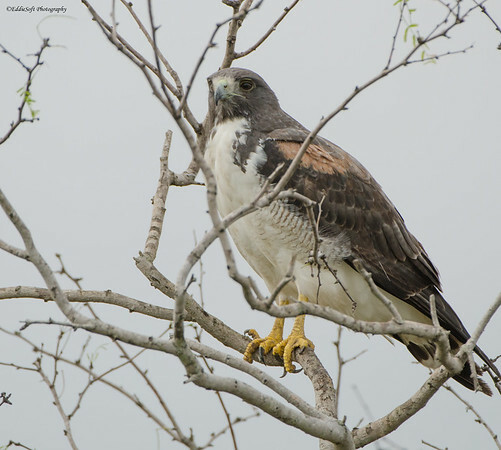 They seem to be the Hawk with the largest latitude span extending down into the Caribbeans. Lastly, juveniles have a 15% longer tail than adults – their tail feathers are not able to cover that length completely. Our specimen besides being very large, had sufficient coverage indicating it is indeed an adult. That’s all I have for you on this particular bird. Hope you enjoyed reading about my latest addition. Now regarding the conversation on pizza size. I hope you realize by now, that the number 8 is the standard cut format for pizzas – half, half, mid slices which always produces … wait for it … 8 slices regardless of the size of the pizza and thus why my math major wife found it so amusing. You are welcome! All of those birds of prey know their cool ha! Note, I think it is actually a White-Tailed based on the research Ron and I were able to do. The Red-Shouldered has barring on the breast which wasn’t apparent on this specimen. Oh, I may have skimmed too quickly through your words and descriptions.